The line started in 2005 and was canceled (or at least put on indefinite hold) a couple of years later. 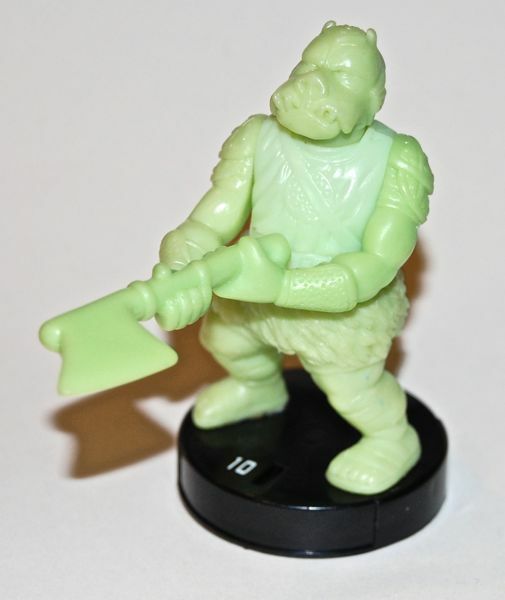 There were four main series of figures released, but I recently discovered that Hasbro actually created a Series 5 and released pictures of it before deciding to can Attacktix altogether. 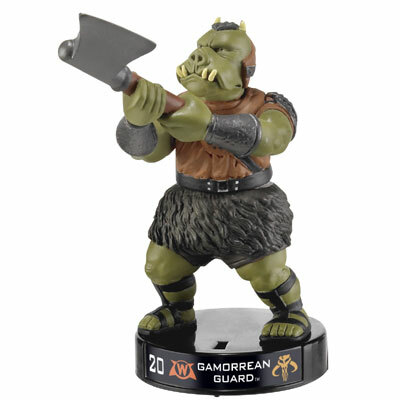 This Gamorrean Guard was part of that unreleased series. You can see what it would have looked like when painted in the picture above. This figure manages to escape the freaky oversized look of so many of the characters. In fact, it’s a pretty nice sculpt. Like most Attacktix figures, he’s got an action feature in the form of a spring-loaded waist that allows him to swing his axe. You can also move his arms up and down, and turn his head. He’s a large figure at about 3″ tall, and it’s got a nice heft to it. Here he is with the Attacktix Jabba the Hutt. I got this from an eBay seller in Hong Kong, and I’m not sure how many exist. It’s certainly not one-of-a-kind, but it’s also a lot more rare than normal figures of this type, since it never went into production.